Indians have always encouraged ‘Samvaad’ – art of constructive conversations. The IIM Bangalore business conclave provides a platform for such enlightening talks that forces one to contemplate on prevalent topics. The event attracts CxOs, Strategists & Technology Evangelists, Thought leaders, Entrepreneurs and Professions Pioneering change to come together to analyse real-world business scenarios, stimulate meaningful discussions and deliberate disruptive ideas. 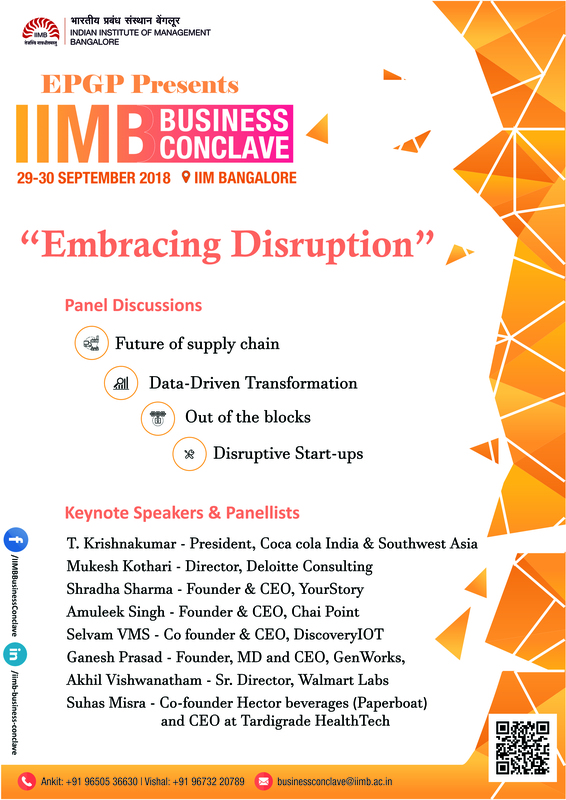 Themed ‘Embracing Disruption’, the conclave will have four key panels covering the Future of Supply Chain, Data-Driven Transformation, Out of the Blocks, and Disruptive Non-Tech Start-ups. Speakers include T. Krishnakumar, President of The Coca-Cola Company’s India and Southwest Asia business, Mukesh Kothari, Director at Deloitte Consulting, Amuleek Singh, Founder & CEO, Chai Point, Suhas Misra, Co-founder, Hector Beverages (Paperboat) and CEO at Tardigrade HealthTech, Shradha Sharma, Founder & CEO at YourStory, Akhil Vishwanatham, Sr. Director at Walmart Labs, Selvam VMS, Co-founder & CEO at DiscoveryIoT, Ganesh Prasad, Founder, MD & CEO of GenWorks, among others.